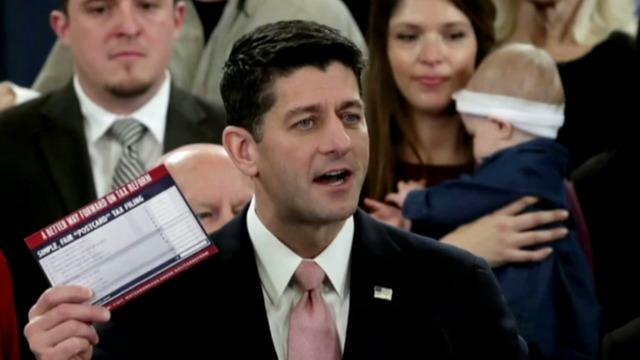 A majority of Americans disapprove of the GOP tax plans and believe the wealthy will benefit, a new Quinnipiac University poll finds as the House gets ready to vote on their proposals before Thanksgiving. A Quinnipiac poll released Wednesday finds voters disapprove of the Republican tax plan — there is one version in the House and one in the Senate — by 52-25 percent. Among Republican voters, 60 percent approve of the plan, 15 percent disapprove and 26 percent are undecided, while every other party, gender, education, age and racial demographic disapproved in the poll. Voters also think the plan, although it's billed as a tax break for the middle class, benefits the wealthy the most. Of those polled, 61 percent of voters say the wealthy would benefit the most, while 24 percent say the middle class would mainly benefit. Respondents also said 59-33 percent that the plan favors the rich at the expense of middle-class families. Only 16 percent of American voters who responded say the plan would reduce their taxes. They're far more likely to think the plan will increase their taxes (35 percent) or keep them roughly the same (36 percent). The poll comes as the House is set to vote on its tax legislation on Thursday, and as the Senate finalizes its plan. The House and Senate plans have some key differences, which could prove contentious as the upper and lower chambers work to reconcile their differences. The Senate plan eliminates the individual mandate under Obamacare, while the House version does not. On another hot-button issue of late, respondents overwhelmingly approved of universal background checks for gun purchases. After the Texas church shooting that left 26 people, including children, dead, respondents supported universal background checks for gun purchases 95-4 percent, and by 94-5 percent among voters who live in households with a gun. Most voters — 59 percent — also think it is too easy to buy a gun. But, while a majority of respondents support stronger gun control restrictions, they aren't sure that will solve the problem. Only 34 percent of respondents said stricter gun laws would prevent mass shootings, while 62 percent said assailants would find away around any laws to harm people anyways. Quinnipiac University surveyed 1,577 voters between Nov. 7 and Nov. 13.